The Ameriglide Traveler mobility scooter tips the scales at less than 100 pounds. This is fully assembled with the batteries so this is a very lightweight scooter. It also quickly disassembles into 5 lightweight pieces which makes it even super easy to load into the the trunk of your vehicle. There is a weight capacity of 275 pounds and sports a modular design making the servicing of this scooter extremely easy, the Traveler is the the best choice if your looking for a low cost, convenient scooter use. 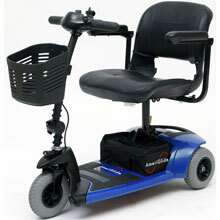 This mobility scooter also comes equipped with a drop in battery pack that is very easy to use. If you keep an extra battery pack handy then it’s just a matter of dropping in the new one to start motoring along again. There are no wires to connect. If you add an additional battery pack to your order then you can swap them and never be stranded with a dead chair. This durable and easy to use mobility scooter is an excellent choice when you have a budget in mind. Coming in at less than $550 you can’t beat the price. I would highly recommend this to anyone looking for a second chair or someone on a budget. Is a Mobility Scooter Right for You?